This huge tendril of magnetic plasma erupted from the sun on Dec. 6, 2010. In this photo from NASA's Solar Dynamics Observatory, the filament stretches across nearly 700,000 km of the sun's surface. A massive solar storm erupted from the sun today, creating a huge tendril of plasma that stretched across the face of the star. The giant solar eruption created a long filament of magnetic plasma, which extended an astounding 435,000 miles (700,000 kilometers) – nearly twice the distance between the Earth and the moon – across the sun's southeastern region, according to the website Spaceweather.com, which monitors solar storms and sky events. "The massive structure is an easy target for backyard telescopes (monitoring is encouraged) and it has the potential for an impressive eruption if it happens to collapse in the hours or days ahead," Spaceweather.com reported in an update. The website described the solar prominence as a "mega-filament." Skywatchers should never look directly at the sun with their unaided eyes or through a telescope. Permanent eye damage can result. Instead, proper telescope filters or protective glasses from reputable astronomy dealers should be used for solar observations. But amateur astronomers with the right equipment to safely observe the sun should act fast. The large solar filament won't last forever. "So far the massive structure has hovered quietly above the stellar surface, but now it is showing signs of instability," Spaceweather.com reporter. "Long filaments like this one have been known to collapse with explosive results when they hit the stellar surface below." 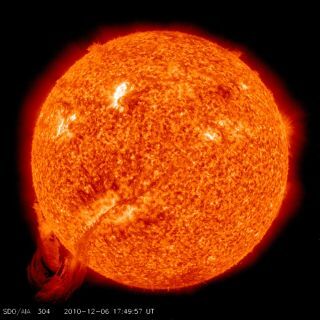 The sun is in the midst of an extremely active period of its 11-year solar weather cycle after a long lull in activity. This latest solar filament follows on the heels of a similar prominent sun eruption last month. That earlier solar filament was spotted on Nov. 16 and stretched across just over 372,800 miles (600,000 km), making it a shorter than the new filament spotted today. The Solar Dynamics Observatory and several other spacecraft keep constant watch on the sun to track solar weather activity.